The rain may have fallen, but that did not dampen the action at Wadham Lodge on Wednesday evening Walthamstow took on Hullbridge Sports. The visitors knew a win would move them up to 2nd and back in Stansted’s slipstream. The hosts are having a much-improved season from last season’s struggles and needed a win themselves if they wanted to finish the season in the higher echelons of the ESL table. Sports are going for the title and so came out the traps, putting Stow under pressure but were only able to win a few early corners, one of which saw Ollie Sotoyinbo getting a shot off that James Bransgrove saved. Dwade James went on to win Walthamstow a corner after his run and subsequent cross was cleared. The resulting corner bobbled around Hullbridge’s box until Kyan Gulliver knocked it away for yet another Walthamstow corner. While that was cleared away without too much trouble, the ball was soon played back in and Leon McKenzie swung a leg and hit a goal-bound shot that was blocked. During this spell Walthamstow even had a good shout for a penalty turned down after McKenzie was felled in the box. It came as no surprise then when Stow took the lead on 20 minutes. Correy Davidson scoring a self-made goal, as he went on a forward run and then unleashed a shot that bent around Lewis Greene. But Stow were to hold the lead for a mere minute as straight from the re-start Hullbridge played a ball into Walthamstow’s box that was turned in by Sotoyinbo. Having had to soak up a bit of pressure, and then conceding, Hullbridge after drawing level now put their hosts under constant pressure as the rest of the half progressed. A Jamal Allen cross was fired goalward by Perry Dunn but was blocked, then in the 39th minute Joe Skeels drilled a free kick just over. Dan Okoh fired another Hullbridge effort over, as the visitors closed the half in the ascendancy, although Bransgrove the Stow ‘keeper hadn’t actually been called upon to make any saves. Greene, the Hullbridge stopper, had that honour in first half stoppage time, denying Davidson with McKenzie just failing to connect with the rebound. 1-1 at half-time then with all to play for in the second half. The second half opened in a heavy downpour, but that didn’t dampen Hullbridge who created an early opportunity after Courtney Homans floated a nice ball over Stow’s defence that Sotoyinbo latched onto but his shot went an inch the wrong way of the left-hand post. Stow then opened up with a well worked move resulting in James having a shot parried by Greene, after good work by Samrai Gebrai. Sadly for James he could only skew the rebound wide. A McKenzie header was also saved by Greene, with the Hullbridge stopper then using his legs to block a Luke Stanley shot. Stow were to be denied by a goal line clearance from Dunn, who hooked away a powerful Davidson shot that had left Greene well beaten. A few yellow cards were dished out as some of the tackles became full-bloodied. The referee was to dish out one red card adjudging Jaffa Hussein to have gone in a bit too heavy on a Hullbridge player on the hour. Hornsley had a shot brilliantly tipped over the bar by Greene in the 63rd minute. But four minutes later Greene could only parry a Skeels free kick which allowed Dunn the opportunity to poke the loose ball into the net. Stow rallied almost straight away, with McKenzie heading a ball into the net, but the almost instant equaliser was to be chalked off for offside. That caused a fair bit of consternation from the Walthamstow faithful. Both teams deserve credit for continuing to battle on as the pitch turned into a mud bath. Hornsley ran onto one through ball but was tackled by Craig Pope, and then a Stow counter attack saw Gebrai dink a ball over to James, but his charge towards Hullbridge’s goal was stopped by the Assistant Referee’s offside flag. It was to be Hullbridge that had the final chance with Nathan Scarborough drilling a shot that Bransgrove tipped away. This result means Hullbridge move up to 2nd, four points behind leaders Stansted, with a game in hand. Walthamstow remain 6th and by an odd quirk of fate could do Hullbridge a favour on Saturday if they beat Stansted. Walthamstow: James Bransgrove, Ross Pope, Kyan Gulliver, Ryan Maxwell (Luke Stanley 46’), Craig Pope (Capt), Jaffa Hussain, Samrai Gebrai (Ben Crilley 86’), Jack Folan, Dwade James, Leon McKenzie (Marcus Bowers 80’), Correy Davidson. Scorer – Correy Davidson (20’). 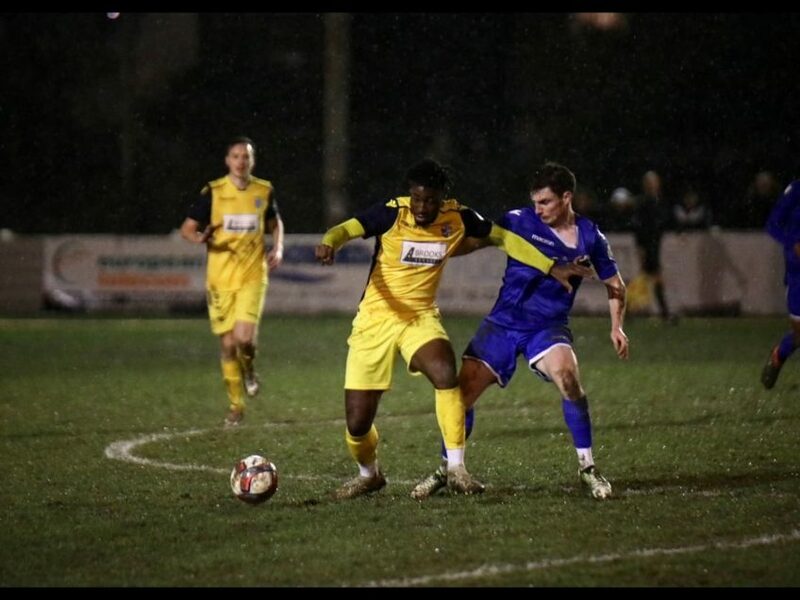 Hullbridge Sports: Lewis Greene, Matt Rose (Capt), Jamal Allen, Perry Dunn, Courtney Homans, Joe Skeels, Ollie Sotoyinbo (Jonas Fuadiantu 81’), Luke Hornsley, Nathan Scarborough, Eman Okunja, Dan Okah (Sam Taylor 70’). Scorers – Ollie Sotoyinbo (21’), Perry Dunn (67’).